Melbourne's route 96 tram has been named in National Geographic's "Journeys of a Lifetime" coffee table book as one of the planet's top 10 "trolley car" rides. 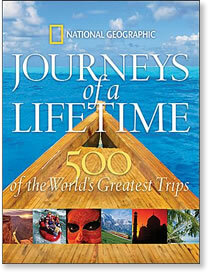 Journeys of a Lifetime also features 22 fun Top 10 lists in all sorts of categories. What are the world's top 10 elevator rides, bridges to walk across, trolley rides, ancient highways, or underground walking adventures? IT MIGHT have just been named one of the world's top 10 tram rides, but that wasn't impressing passengers aboard the number 96 tram between St Kilda and East Brunswick yesterday. "It gets that packed after five you can't get a seat - sometimes you can't even stand it's that packed," said Ian Bowman from Sunbury, en route to Southern Cross Station. But if you made it on board before 5pm, it was a great journey, he said. Few would realise how great in the eyes of outsiders: Melbourne's route 96 tram has been named in National Geographic's new Journeys of a Lifetime coffee table book, which lists the world's top 500 journeys. Among the planet's top 10 "trolley car" rides is Melbourne's route 96. It is a distinction shared with routes as far-flung as Hong Kong, Budapest and San Francisco. Seattle's waterfront service, run with some of Melbourne's old W-class trams, also made the list. The route 96 tram is Melbourne's busiest, with 35,000 passengers a day. At peak times, 19 trams work the 14-kilometre route, which takes 50 minutes to travel from East Brunswick through Carlton and the CBD and then past Albert Park before finishing at Acland Street in St Kilda. The 96 once terminated at the corner of Bourke and Spencer streets, but took over the old St Kilda train line after it closed in 1988. Back then, Beverley Grant from Middle Park, who spoke to The Age as she waited for her tram, thought the Cain Government's move to replace the train with a tram was a con. "We all thought we were losing our beloved rail line," she said. But two decades later, all had turned out well: "Now it's such an interesting line. You have the sophisticated working people, the young people with their radios in their ears. Then you have the backpackers going to St Kilda, hauling their huge packs. And then there's still some of the down-and-outs from the old St Kilda." The Public Transport Users Association welcomed the listing. "Trams are the envy not only of other cities, but also of middle and outer-suburban Melburnians, many of whom wish they had public transport half as good," president Daniel Bowen said. But like many Melbourne tram routes, the 96 was overcrowded and could be faster, he said. More needed to be done to make sure trams had traffic light priority at all intersections. This would cut journey times between 20% and 50%, a PTUA study found last year. No one knows the world like National Geographic-and in this lavish volume, we reveal our picks for the world's most fabulous journeys, along with helpful information for readers who want to try them out.